The past week has been just such a blissful family centered whirlwind of fun. As much as I do love the beach, the lake house turned out to be absolutely perfect for my little family this year. We laughed and enjoyed each other’s company and just really unplugged for 7 wonderful days. Also, since it had wifi and a complete FIOS package, I didn’t miss a single minute of NOVA or other highbrow documentary type shows. The tv also got left on some network by mistake one night, or maybe two and I saw something called Bachelor in Paradise. Disgusting! I can’t imagine why people watch this kind of trash! Last night was our final one at the lake. Röbert took the children out for a canoe trip/treasure hunt he had made up. They had to find things like “the tallest tree” or “the rock that looks like a bear”. Ridiculous, but it kept them all entertained for a bit. 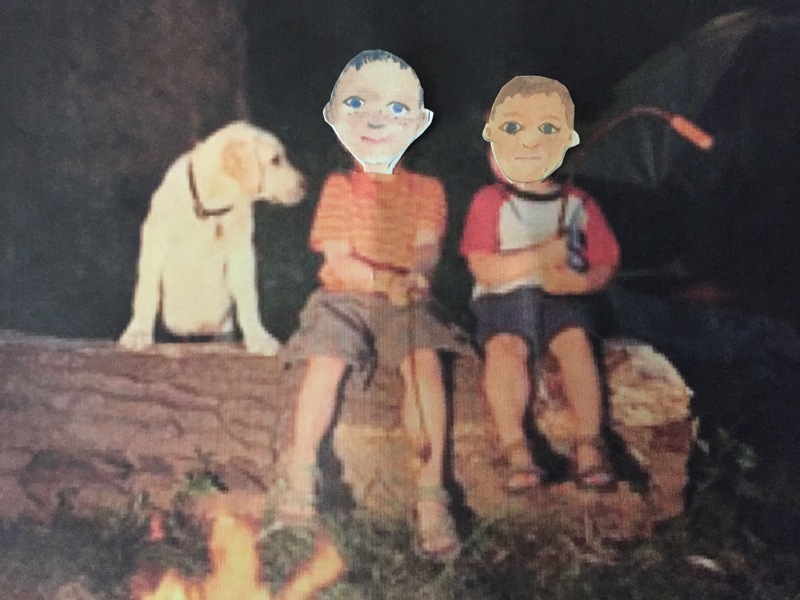 We had a campfire when they got back and Röbert had, in fact, bought hot dogs. Who eats hot dogs? I guess my kiddos did last night, along with corn on the cob and a potato salad. It was like a nightmare dinner, and I couldn’t watch them eat it without feeling like I was going to throw up, so I went inside and watched Dateline, which is also kind of trashy, but better than potato salad. I told them not to give any to poor Beefeater. I have him on a vegan diet right now and who knows what those nasty things would do to his system! I could hear them out there, laughing and singing until late, then Röbert, of course, got them all wound up with a scary story. I don’t know what he was thinking. He had to get up all night to settle them down. Anywho, I am exhausted now, and need a vacay from my vacay! I think I will maybe meet up with Cari and Krystyn tonight for some civilized cocktails at a new fancy lounge that opened up downtown. This entry was posted in Vacation and tagged Beefeater, last night, Röbert, scary story, treasure hunt, weenie roast on August 8, 2015 by mythreeangles. I’m sure at points you did have a lot of fun, but I think you’re going to suffer from some serious PTSD when you settle back in at home. HOT DOGS???? Potato Salad???? “Bachelor in whatever”??? I mean…. Once again, you were a SAINT Lah Lee. No woman should lose their time at the gym, all of their alone time, AND be subjected to my grain inducing vacations like this! We won’t even talk about that fatty Kathy. Ugh. I know you say you’re ok, but please know we who understand you know you are NOT. Please take many naps. Have many glasses of wine and do not allow anyone to encourage Hummus to talk. You need your sanity now. Not a little chatter box! Stay strong in your recovery from this “vacation” and remember school begins again soon and the children will be where they are supposed to be. With teachers! It is hard to believe how much I gave up, but my week was perfect! You always put on such a brave face LL. I was so pleased to see that you did manage to get in a few hours for memory making photos! How else will the children and their friends truly understand what a remarkable family and childhood they have? And it’s like they say, pics or it didn’t happen lol! Glad you had fun but I hope you take it easy for awhile and make sure you get some ‘me time’ in after a stressful – though magical – week. I spent today doing a lil’ retail therapy with my friends. It is exhausting spending so much time with my kiddos. Your littles are so lucky to have a dedicated mama! And I’m sure your maternal skills make Robert love you so, so much more. I bet stupid Karen’s kids are dim bulbs and lazy. Hot dogs?! That food isn’t even fit for a dog. So glad you are started Beefeater on that vegan diet. Very important to not have a fat dog ruin the image of your perfect family. Just curious what did Starving ate? I know you wouldn’t feed her such trashy food. But I guess it is ok for Merlin to eat, at least until he earns his keep. Starling didn’t eat a thing, the little sweetheart. She was inside cutting skinny models out of fashion magazines to go on her vision board. OMG!!! I spent my childhood doing that too! Aside from my bouts with Anorexia and Bulimia, I’m tots a supermodel’s weight well into my 40’s. You should be so proud! I’m sorry, that’s ridicuolous, B-Bob is a terrible father. HOT DOGS??? Ghost stories? A ridiculous treasure hunt? Psssht. Lah Lee I just cannot say enough how much inspiration you give me for my fat, ugly cat. Beefeater looks thinner and younger everyday! You have to share your secrets with your loyal readers!